Take a 2-hour guided SUP tour down the Murrells Inlet or the Waccamaw River in Myrtle Beach. 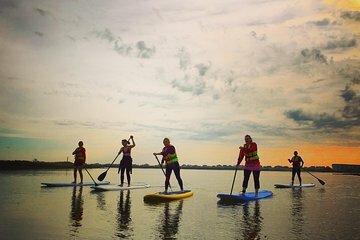 Get comfortable with our paddleboards and see some of South Carolina’s coastal scenery and local wildlife. Choose from multiple departures throughout the day, including sunrise and sunset tours, and locations are chosen based on current tides and weather conditions. We had an amazing time. Tim was extremely helpful with all 4 of us getting comfortable on the paddle boards. None of us had ever done it before so the guidance was the foundation of a very successful adventure. Thank you again! !